Many rural libraries in developing countries perish early from neglect, and lack of on-going management, relevant programs, or sustained community involvement. The Riecken Foundation, with its contribution, guides the overall establishment of the library, providing direction, financial resources, ongoing training and programming. If our model is something you would like to support, see how you can help here. 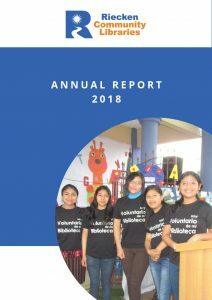 Read About Our Work in 2018! The key to sustainable success of the Riecken Community Library network is the committed partnership of community, local government and Riecken, working together to provide on-going management, relevant programs, and sustained community involvement. Opening a new Riecken library requires that citizens form a Support Committee responsible for acquiring land or a building exclusively for library functions, assuring librarians’ wages and operating expenses (water, electricity, and security). Prior to operation of the library, the community must have democratically elected board members and librarians who will administer the libraries. In most cases, municipalities assume salary and operational costs.The Riecken Foundation provides 80% of the costs of construction or renovation of library facilities, gives a minimum of 1,000 books, five computers, one printer, one photocopier and library furniture. During construction, the Riecken Foundation also initiates the training of staff and management of library programming.